Jon Olsson gave us the Kangaroo flip.1970&rsquo;s Hot Dogging extraordinaire Eddie Lincoln whipped his rear-entry boots and straight skis through the first Lincoln Loop and now bags more photo captions than one man could ever dream of. Now it is time for you to join the club. 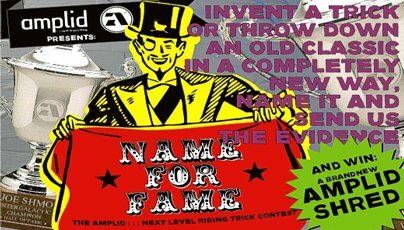 Amplid wants you to create a completely new trick or add your own little twist to a classic. Have two years in a yoga camp made you so flexible that grabs considered impossible to ordinary humans are like pulling a simple mute for you? Has bouncing tirelessly all summer on the trampoline in your backyard secretly developing a mind boggling invert paid off? Who knows what trickery you&rsquo;ve got stashed away in your own private arsenal of bangers, but if it&rsquo;s unique we want to see it. Once you&rsquo;ve nailed your signature trick and captured it on video or in a photo, we want you to send us the evidence. If your entry is the judge&rsquo;s favorite you will win a pair of our new Amplid Provoke Skis. Submissions can be made from Tuesday 29th November 2011 and the last day for entries is Saturday 28th January 2012. Visit the Amplid Facebook Page for more competition details, and for more info on Amplid products and riders check out http://www.amplid.com.